When it comes to our beauty routine, who doesn't want to save time, money or get a better result? If you're in a beauty rut, try out one of these new products to get a new look. "Every once in a while, a new beauty product or technique comes along that really makes a huge difference in our beauty routine. 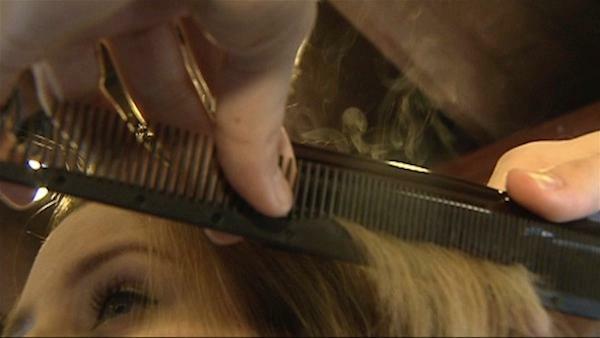 We like to call these game changers," says Rachel Gower, owner of The Upper Hand Salon. Shaped like an egg, it's really a sponge for applying perfect, flawless foundation. Dip it in water, wringing it out, and then apply your foundation. You can also use it to apply powder foundation. Where to find it: Available at Sephora for about $20. Use it to guard the under-eye area against eye shadow and mascara fallout while you're putting on your makeup. Also use it to get the perfect application of eye liner or to get even contour application as well. Where to find it: Available online for about $8 at olliegirl.com. It looks just like an eye or lip pencil, but it's a skin barrier that comes in three different shades. This magic pencil can be used as a highlighter, to cover a blemish, to outline the cupid's bow, etc. Where to find it: Available at drugstores for about $5 or at nyxcosmetics.com. It adds a little bit of a "microtexture" to the hair, which creates internal bulk and eliminates the need for damaging teasing. Where to find it: Available at salons and online for about $40. What makes this flat iron really unique is the technology. It takes the guess work out because it only has four settings and it goes by hair type. The temperature settings go from fine, normal, coarse, to a professional setting. Where to find it: Available at salons and online for about $138. Buy your own polish and take it to your favorite manicurist. It cures using natural light, so there's no need to put your hand in a UV lamp. This product gives you a gel finish, but it's very easy to take off so there's no long removal process. If you go and have this done in a salon, it will probably be about the same price as your normal manicure. If you buy it, it will range anywhere from $15 to $30. Where to find it: Available at salons and at cnd.com.